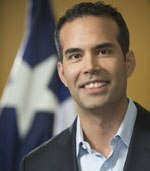 Today, Texas Land Commissioner George P. Bush announced that due to the federal government shutdown, the Veterans Land Board unanimously voted to place a freeze on loan payments for federal employees who are Veterans and hold a home or land loan with the Veterans Land Board. To be eligible, Veterans must contact their loan servicer and provide verification of furlough. Applicants must be a federal government employee currently furloughed without pay or working without pay. Anyone seeking a forbearance must apply to the appropriate loan servicer for relief. The applicant must provide income statements and other information establishing the need for a forbearance. The agreement may be for no greater term than six months or 30 days from the date the federal government shutdown ends, whichever occurs first. Only those loans which are currently held by the VLB will be eligible for consideration. Loans which have been sold to a third party are not subject to this authorization. The loan term may be extended by the term of the forbearance, but in no event for an overall loan term of greater than forty years. Interest, penalties etc. will not be forgiven.